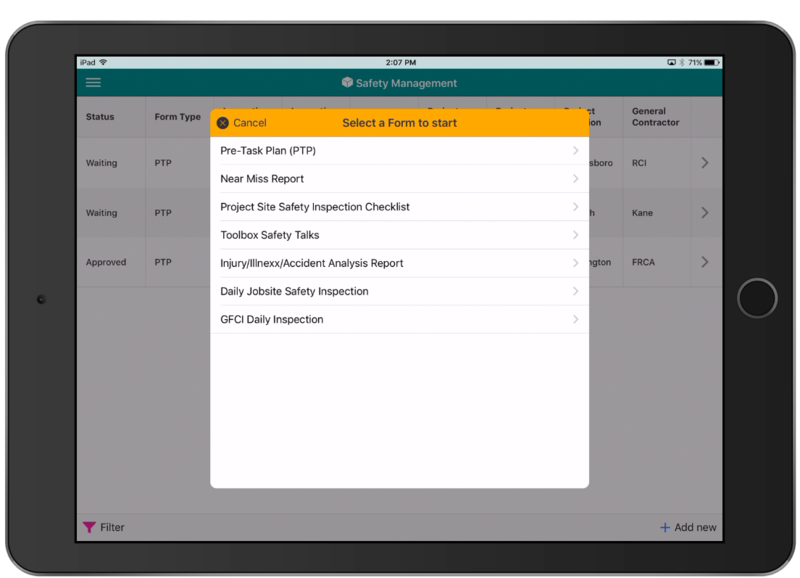 Any type of safety and/or inspection form your organization uses can be added to the XForms platform for your company’s use. You are used to using your forms, so why change your process to accomodate someone else’s forms? The software should accomodate you, not the other way around. XForms works the way you work. 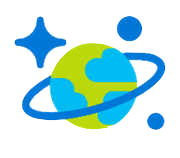 Use an iPad, a Samsung Galaxy Tab, an iPhone, an Android phone, or a Windows Phone natively, without an internet connection. 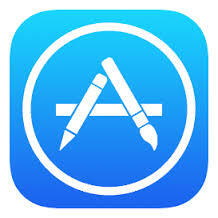 Prefer to use a Macintosh laptop or Windows desktop? XForms apps run on those too. Or use a web browser on your PC, Mac, or laptop. Our solution is nearly hardware-agnostic (with the exception of Blackberry…we don’t run on that OS) and works with most anything that is relatively modern, even Linux. 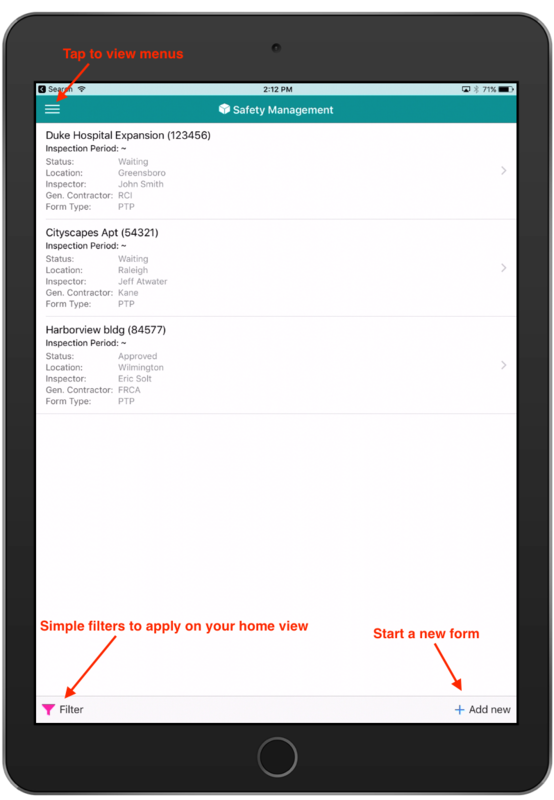 View data vertically in landscape mode, and data in columns when the device is in landscape orientation. This auto-detection of orientation and device type makes it easy to use a small screen smartphone to view your data. Simple filtering mechanism to filter and find specific records. One button click to start a new main form. Tap on the hamburger menu to slide out a menu with additional actions. Tap on a record to open that record, where you can then view it, edit it (depends on the user permissions and other controls), or print it to PDF. Depending on the user permissions, toggle a record from active to inactive, add details as appropriate, add a new record, delete a record, etc. Tap on the + button on the bottom of the screen to start a new main form. 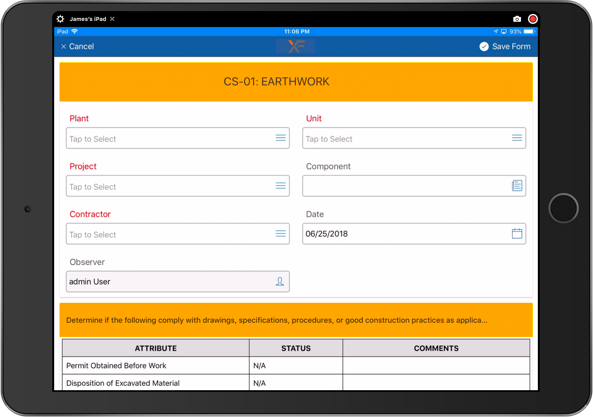 XForms/Safety supports workflow-based subforms creation, which is a complicated way of saying that by tapping on a checkbox, you can start a subform and pre-populate it with some of the same information you entered on the main form. This helps the user by automatically creating the correct subform, and inserting already-entered information without having to re-enter the same information on the subform. 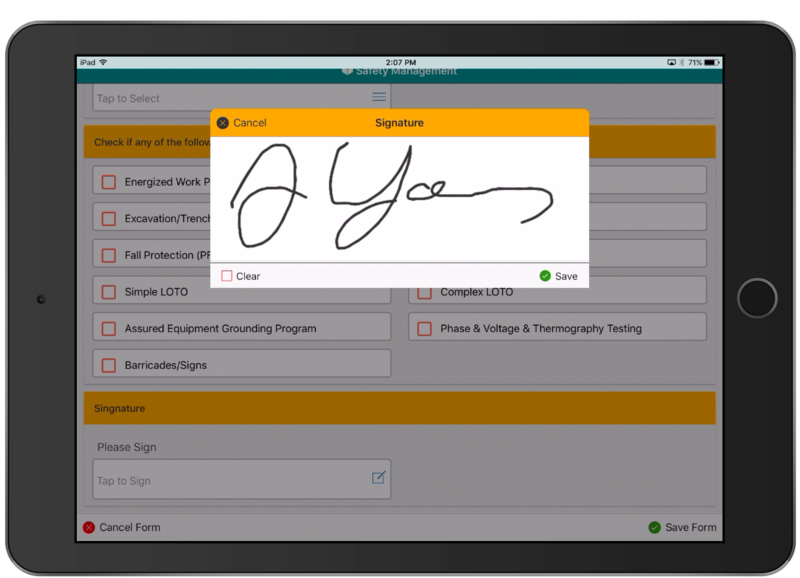 Tap on the “Sign Here” field to popup a signature block. Automatically route forms needing review and signature to the right person(s) in your organization once you save the form. 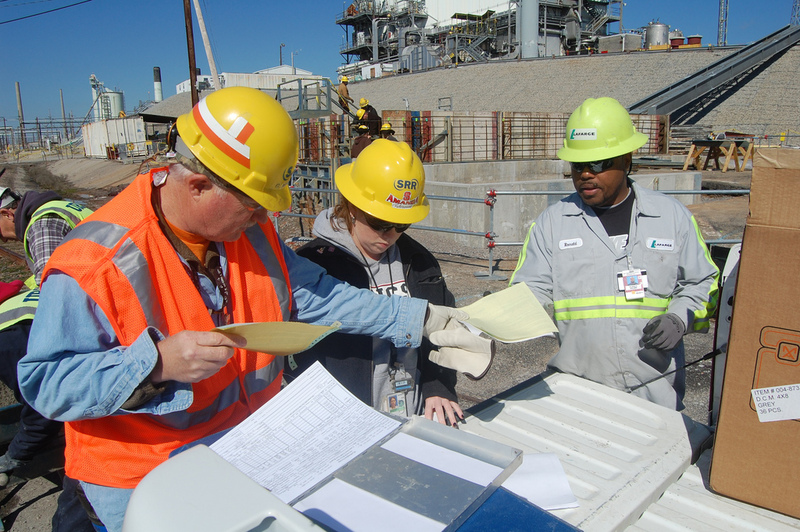 Email and push notifications alert the recipients of an incoming safety form review request. Once reviewed, email and push notifications are sent back to the form initiator, alerting them of form approval or rejection including comments/notes. 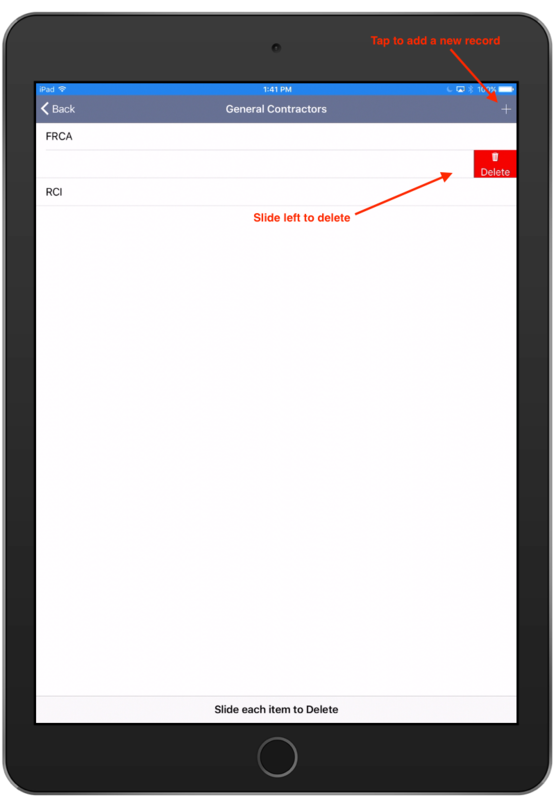 Print a completed form (or subform) by tapping on the PDF icon on the top right of the screen. Use the zoom in/zoom out controls to get a closer look at a specific area of the PDF. Tap on the email icon to send the form to someone by email. Use your own wording, language, checkboxes, and fields on your forms. The same ones your organization is already used to using. No need to learn any new terminology. Add more forms not available in our current list of forms. 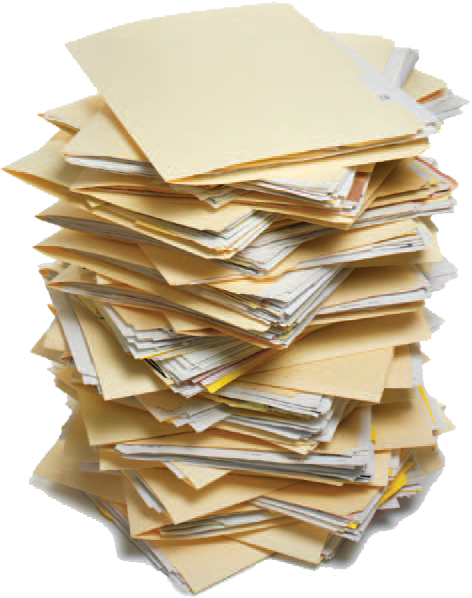 Print to PDF in the same exact format your forms are already in. We can customize your experience such that it is minimally disruptive and follows your existing form nomenclature and workflow. 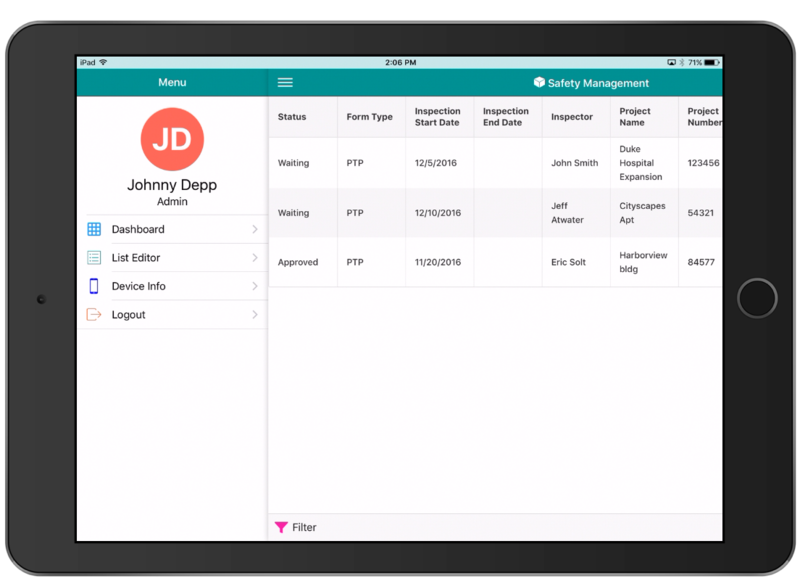 Contact us for a demo or for more information on how XForms/Safety can help your organization.